What can a Salesforce Community Do? I get this question about once a month… now I am revealing my answer! As a Salesforce Community Leader, I am asked to help in a variety of ways beyond just facilitate meetings. To mentor other community members through a tough question (technical or not) they may have and need a sounding board. I run a small local nonprofit and we just received our 10 donated licenses of Salesforce NPSP which we are grateful beyond belief. We have a small staff of a few people and we need help getting started with Salesforce. Do you think your community can help? It struck me that these requests need to be put together and the community can help to do this. I put out a question on the Twin Cities Trailblazer Community page to ask if anyone would be interested in volunteering to help a nonprofit build their Salesforce instance. I got an immediate amazing response. Yes, people were willing to help and more people would help than I could fit in a room. It was an overwhelming response, so I knew that the hunger to help and learn more was out there. I ended up with a group of 6 outstanding Salesforce community members who agreed to meet with me at the nonprofit, get to know the organization and see how we can help them be successful. We met on Monday nights for about 12 weeks and helped the organization with onboarding steps with Salesforce and making decisions around how to build out their Salesforce org, including accounts, contacts and giving opportunities. We analyzed and consulted on connections with Mailchimp, Classy, Eventbrite, and Google Mail. Overall we had great success for this organization and made great strides in helping them on their way to a positive use of Salesforce. How to get All this Paperwork into Salesforce? Group dynamics: We learned how to do things as a team of Admins and were able to bounce “what if” scenarios off each other and share how we do different scenarios at other organizations we have had experience with or things we have learned on Trailhead or through Certifications. Networking: We learned more about the other volunteers and got a deeper understanding about why they volunteered. This networking is so valuable and I consider this team to be an amazing group of admins. Empathy: Understanding more about the nonprofit and how what they do makes a difference for the lives of men and women in the community. Salesforce Skills: We increased our understanding of Salesforce and gained an appreciation of how 10 free licenses of a cloud CRM software can impact a small nonprofit so much! Was this a successful trial? Yes, it was! Within only a few weeks, we were able to help the nonprofit to link donors and donations to Salesforce, and start to track their efforts through the year. All charts show improvement in Donors and Leads! Since we started this little community volunteer group, I have had 3 more nonprofit organizations reach out to me and ask “How can your community help us to kick-start our Salesforce instance?” I am pumped to imagine a win-win scenario where community members who need opportunity and experience will match up with those orgs who need people to help volunteer. What can a Community Group do? Based on our experiment, the Sky is the Limit! Designed and built a set of APEX classes that selected yesterday’s “sales items” and sent them to the fulfillment vendor’s API for shipment. Then next day, another set of APEX classes would get a file from an Amazon S3 bucket that would show the status of those items (shipped, back-ordered, cancelled, etc) and bring back to Salesforce for customer service review. My employer created a “member portal” on it’s website and I designed a way for the data in the member portal to match up with the Salesforce contact data in an automated way, using custom formula fields and process builder. Started a “CRM Governance Team” at employer to start handling strategic long-term issues around value and future use of CRM products, processes, and policies. Used new integration tools like Zapier to bring in new data to the CRM system. In my 2nd year of a Mentor at my Adopted High School, I was elected as Chair for the St Paul School District’s “Technical and Continuing Education” Advisory Board. I hosted the high school students to my place of employment for a tour and visit to learn about public media and broadcasting. It was great. Also, started a group of volunteers to help a local nonprofit to build out their Salesforce NPSP org. We meet on Monday nights to collaborate with this nonprofit and team up together to do amazing things in the Salesforce platform. Trips: I was able to speak at Tahoe Dreamin, and at Dreamforce this year. Baseball: I demoted myself to “Assistant Coach” this year and am so happy I did this. I enjoy coaching baseball, but I don’t really get a high on being head coach. I want to continue this next year. Health: I have been working with professionals to work on health related concerns and this has been a real journey, but has seen some positive results. work with internal Governance Team to build better internal processes and policies about CRM usage. Discuss leadership, strategy and innovation internally to build the value of the CRM. Expand the Governance team to include Superusers in departments to build leadership in the internal User community. Collaborate with Salesforce.org Probono program in a Design/Strategy session. Go on Fossil and Rock hunting, camping, hiking and swimming. Volunteer Work / School: Will continue to work with my adopted high school and may be also helping out an elementary school in the coming year. Will plan on finishing our Monday night volunteer project and perhaps look for a new non-profit to help as the year moves on. Trips: Not sure if we will be traveling much this year, but we are planning to host some international guests this summer. Baseball: I am planning on signing up for baseball coaching again this summer. Health: Will continue to work on my health in 2019 and have some goals for this item as well. This year wasn’t going to be about shopping and crazy lines for me and my family. We spent our week preparing for family gatherings and getting the supplies ready to do a large smoked turkey to bring to my mother-in-laws. It was full of laughter and celebrations. There are two things on my families gift list that is in the electronics section, so I went to looking for it. Low and behold, it was more difficult to find them in this remodel. Maybe that makes me look at more stuff? or just get more irritated by the shopping process? When I finally did find the item (a new camera), we realized we would need to find someone at Target who can help us get the camera behind a locked case. Ok, I thought, there are lots of employees standing around, so I went to speak with one. He said “No, I cannot help you, I don’t work in that department” (but… you are standing right here??) I went to speak with a person behind the electronics counter and there are already some folks in line. Someone asks me if I need help and I say I would like to buy a certain camera. He dispatches another person who walks with me back to the camera isle. He stares at me for a second, as if not understanding the question. My wife leans over to me because she has a mobile phone and has already figured out that they have none in stock but a couple other stores in town do. BINGO! YOU JUST WON THE EMPLOYEE OF THE MONTH CLUB!!! You and that guy who told me the exact same thing at Best Buy 8 years ago! Guess what – telling me I can go online to buy this camera will ENSURE that I will find a better price, a better deal, and a better package than what you can offer me. You just took $800 out of your employers till and sent it to some other company out of town. Match online prices for your products. As soon as you tell me i can go online to order, I am going to search for the best price, its just what I am programmed to do. If you match that price, I will stick with you. Offer packages. If I buy that camera at my local boutique camera store or even on Amazon, they will offer me sweet deals on kits that go with it (nice case, memory cards, tripod, extra charger, etc). So when I say “What can I get with this?” some stores have said, “You are spending $800 today, we will throw in this nice camera kit that you will enjoy using.” It gives me the customer a little feeling of love. Make your store easy to shop at. Your recent remodel made the aisles tighter, so now two people cannot move a cart through at one time, and finding products is a maze. Whereas, finding a product on Amazon is getting easier and easier. Amazon is becoming the hottest search engine where people go to find out information about things to buy. Which brings me to my final point. We are an educated consumer society. I have so many places to find information about products: my friends, coworkers, family, people I meet who use products, Amazon reviews, google searches, YouTube videos, company FAQ sheets, etc. By the time I walk into Target to look at the product hands-on, I have already done a ton of shopping on this product. I don’t need your employee telling me a bunch of facts about it. What I do need is him or her asking “How can I help you with this today?”, then doing everything they can to make a sale happen. Honestly, stores, I want to shop local and I do shop local when I am able. But if you don’t have the products, don’t have the service, and cannot offer to me the way to get the product, I am not sure how you are competing for me? Just a note to say that my most recent blog post actually is at another site! I was asked by my good friends at dazeworks if I would write some Salesforcey things with them and they accepted my first submission! I wrote about my most recent work with Salesforce at my day job, and how we have been working hard to migrate our set of users to the Lightning Interface (LEX). Today was a milestone, as I have 80% of my users in Lightning, and am working on the final 2 groups of users to be migrated before end of July! First, I would say – your path is going to be different than mine. If I were to poll the recipients of the Salesforce Admin Certification, we would find that they have different paths and each one has value. So I must say that my path won’t be your path. That being said, there are some things that I feel would bring a solid base on your way to being certified. Congratulations on taking the path and good luck on your journey! Through my local Salesforce user group, I found other people in the area who wanted to get certified and we started our own study group. We met weekly for 3 months and studied together, using the materials I will list below to work together on quizzing each other on topics and Salesforce functionality. You already have done this if you reached out to me with your question, so you are already networking with others. Keep doing that. Meet others at local user groups, connect with other community members via Twitter or through the Trailblazer Community. For example, there is a Certification Study Group https://success.salesforce.com/_ui/core/chatter/groups/GroupProfilePage?g=0F9300000001pLJ but there are many other groups you can join and participate in. Asking questions to others is a great way to start a conversation. I set a specific date for my Exams – try to be realistic, but set the date. For my Admin Cert, I set a date 3 months out and then strive to hit that date. Having the deadline put pressure on me to continue to study every day knowing that I had to be done. Oh, and then make sure to celebrate for yourself when you are done. It is nice to have the certification and then reward yourself on a job well done. I attended the Trailhead Live event in Minneapolis on Dec 6, 2017. 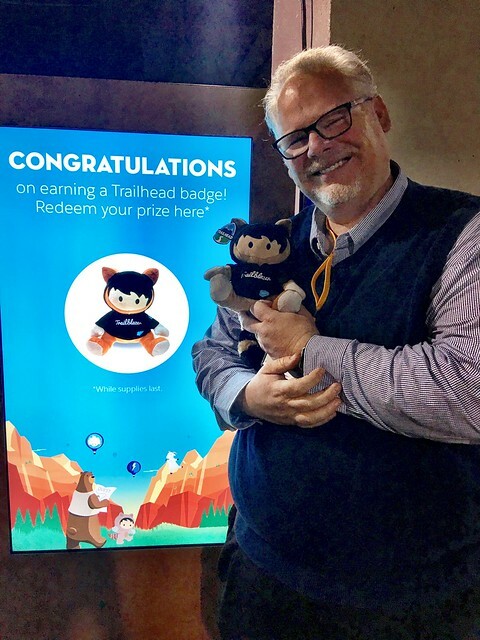 I was not able to attend Dreamforce this year and I was so excited to have Dreamforce come to me via Trailhead Live! So glad that they did, because it was fun, full of learning and I got to meet new people who I have been fans of from far away. Colin Fleming wore a wonderful Astro sweater on a cold Minnesota day! The Keynote was hosted by Colin Fleming (Salesforce Chief Creative Officer) and featured Alex Mastro, Eric Stahl and Kris Lande. These fine presenters showed how TMobile, Adidas, U.S. Bank, and 21st Century Fox are using Salesforce MyEinstien, MyLightning, and MyTrailhead to take their organizations to the next level of Customer Success. There were so many sessions for learning at Trailhead Live, and I got to see presentations from the local Trailblazers like Leyna Hoffer, James Loghry, Ben Bolopue, Justice Sikakane, Shonnah Hughes, Carlos Villalpando, and others. I attended a session on MyEinstein by Darvish Lee Shadravan, who gave me some concrete tips on how I can test Einstien through Trailhead. As always, Salesforce Events are a great way to network with others. On this event, I spoke with Kurt Smith, Leandro Perez and Derrick Strom from Salesforce. I also had 4 of my own Salesforce users from TPT at this event, so we had a chance to discuss our own future with the platform, and considering how our roadmap aligns with Salesforce’s roadmap. The WIT event afterwards was a blast as well. The Minnesota Salesforce WIT group is always coming up with engaging, exciting, and relevant events for the community. They deserve a round of applause for their work. It was just fun that they would show the Trailhead theme in all the decor, marketing and even in the food that they served. Kudos Salesforce Events team! Communities (Community Cloud) – my organization will be coming back to Communities to enable it in our org. Lightning – my organization will be moving to Lightning UI in 2018, and I hope to make this transition a good one for our users. Einstein Prediction Builder – just because it looks so cool and I think I could wow my users by putting some data scenarios through Einstein, I am going to be diving into these and other Trailhead trailmixes. On July 7, 2017 I was invited to speak to the Salesforce Women in Tech (WIT) Diversity group about my role as an Ally. It was the first Ally talk for the WIT Diversity group and I was nervous, but inspired to do the best to explain my story and how it is relevant for the WIT Diversity group. This post is to recap my talk and be used as a asset to support other Equality Allies. In 1973 I was born to a small town Nebraska farm family, and due to a miracle (ask me about my birth story if you are interested) at 3 days old was sent to the University of Nebraska Medical Center in a dire emergency and was found to be born with a Genetic Metabolic Disorder called Galactosemia. Galactosemia is a Genetic Metabolic Disorder in which the body can not break down galactose into glucose to be used in the body. I have 2 gene mutations in my DNA ((Q188R and 1048-del-A) that results in my body retaining excess Galactose as I cannot process it. How did this affect me? Well first off all – I cannot eat Milk or Whey (or any of the followings) You would be surprised how many foods contain milk or whey. I read food labels all the time to see if items have milk products or not. Its a part of my life. I always ate last – so that the host/server can bring you your “special” non-dairy meal once all the “normal” kids have eaten. I always finished lunch/dinner last – so while the other kids are playing I am last to play. (you get the idea – last last last last last) Being last all the time is a target for bullies, and childish names. You are reminded daily that you are “different”. I had adults telling me what I can and cannot eat – what I can and cannot do – where I can and cannot go. As I look back on my childhood, I can say that having Galactosemia has given me empathy for those who are different, those that have been told what to do and what not to do. I survived, and I know that the inconveniences were all in “my best interest”. I was also privileged to go to a good college where I was given a chance to be a Junior Counselor for incoming Freshmen. My assigned roommate was Bryan Bass, one of only 23 black men in a college of 3,100 students. Our dorm room became a safe hub for minorities as other students would reach out to Bryan for advice and to lend an ear to their problems. As Bryan’s roommate and partner, I was in a position to listen and empathize with those who felt they were “different”. I could listen and try to put myself in their situation. My senior year of college, I traveled abroad. I studied in 4 different overseas schools (in Egypt, India, Hong Kong and Japan) and visited 12 different countries in the entire program. It was an amazing experience where I learned about how others live and where people come from, but I also learned many stories about how my privilege as an American has affected the lives of others around the world. One of the best things I ever did was meet and get married to my wife Diane. She is a Woman in Tech and is a trusted adviser to me on WIT-related things. She is involved in Resource Groups at her work and when we go out with friends, it is usually with connections on those Resource Groups. She has a diverse group of friends and colleagues. We have similar morals in our work and how we treat others. (We don’t need to step on someone else to get up in the world and we don’t need to push each other down to make ourselves feel better.) In my working world, I have tried to work at places I am aligned with. We also are trying to show those morals to our son and hope that his experiences in this world include valuing equality, inclusiveness and respect for all people. I think people get stuck on the term “Privilege” and I understand why. Some feel that this is a defensive term to classify people and determine the “haves” and “have-nots”. The more I learn about privilege, I realize that it can also be seen as blessings that you have been given, based on conditions that you have very little control over. Born in the USA (Actually I am 14 generations removed from Stephen Hopkins, who was a signer of the Mayflower Compact – yes that MAYFLOWER in November 11, 1620). Married and have a child. My parents are still alive and still married and are involved in their children’s/grandchildren’s lives. These privileges matter because I am all of those things as who I am and the role that I play in the world. It empowers me to serve others using the privilege that I have. In July 2015, I met Shonnah Hughes and was introduced to the Salesforce #Ohana. I attended the Salesforce Admin Study Group that Shonnah was leading and was welcomed to study with this group. After the class was over, and we had all obtained our Admin Certifications – Shonnah let me know that she and Toya were starting a WIT Diversity group and was I interested in that topic. I was very excited to hear of this and wanted to know more. Shonnah and Toya invited me to join their group and I have been listening and learning about other’s stories. It is marvelous! Got to meet the WIT members in person, those who I followed on the virtual WIT Diversity calls. Networked with many other #Ohana allies. At Dreamforce 2016, I was able to speak with Marc Benioff who issued me a challenge to reach out to my local schools. I have taken this challenge on! I have been appointed to serve on the Career and Technical Education Advisory Board. I have committed myself to adopt a local school program and help them with Funding, Volunteering, and Programming. Expect to see more in upcoming posts on this challenge and my response as time goes on. 1. Don’t give into FEAR. Join a Resource Group / Affinity Group at your work. Be Brave – Find a cause that you really believe in and make it your goal to support it. 4. It’s not all about you. It’s good to KNOCK before opening a door. I knew Shonnah and Toya were starting the WIT Diversity, but did not assume I was invited. I asked Shonnah first. Overall, My journey has only begun. My journey will continue through networking with other colleagues, diversifying my feed on social media and news sources, deepening my relationships with others around the world and working with the students who I will be working with over the coming years…. thanks to Toya, Shonnah and Jen for asking me to speak at the WIT event, and thank you all for supporting my journey. Nonprofit tech. Salesforce. Knitting. Activism - It's a reason not an excuse. This blog is dedicated to helping all those that run or are considering starting a user group to run amazing Salesforce User Groups. Look here for best practices, war stories, successes and challenges fought and overcome. Guest bloggers are welcome.